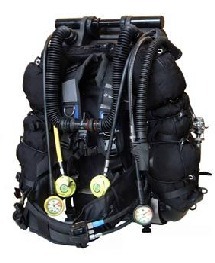 These pages cover the "Trimix version" of the standard "AZIMUTH Rebreather ". The Azimuth trimix version is called the "AF" version. 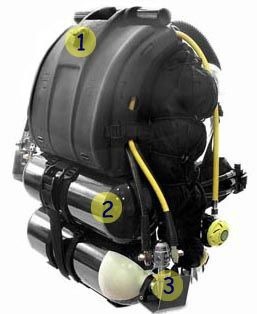 Depends on gas used - technically 120 m.
Azimuth is a semi-closed cyclical circuit breathing apparatus , giving constant and controlled flow. 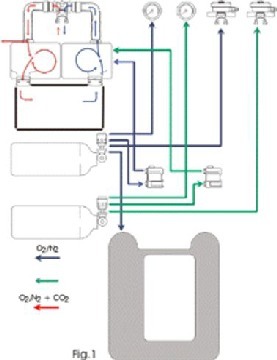 The gas mixtures follows a single direction circular path utilizing two different separated way of circulation, to and from the breathing bag. 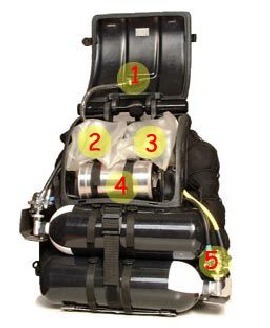 Especially, the constant flow of gas mixture coming from the single cylinders,( trough the respective dosing group) goes in to the inhalation breathing bag and reaches the corresponding pressure to the diving depth. 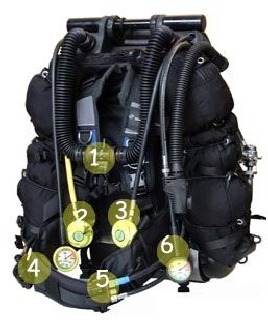 The diver breathes the gas mixture contained in the inhalation breathing bag trough the corrugated hose connected to it, via the mouthpiece assembled on the four-way valve and exhales the gases produced by the breathing process in to the exhalation hose connected to the exhalation breathing bag. Gases from the exhalation breathing bag go in to the filter and once purified from the carbon-dioxide, enter into the inhalation breathing bag. 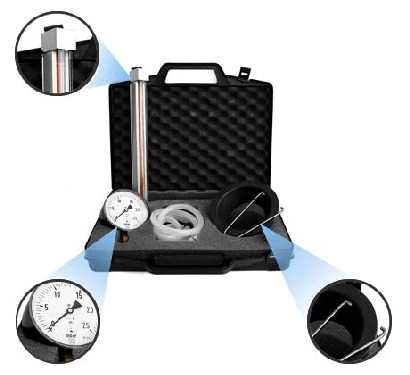 The calibration set for Azimuth e Azimuth AF , optionally supplied, includes all the necessary instruments for a correct pre-diving preparation of the rebreather. It contains: a flow-meter complete with hoses and fittings, for a correct control of the continuous flow calibration injected in the inhalation breathing bag. A pressure gauge with a range from 0 to 25 mbar, complete with hoses and fittings, necessary for a correct pressure control of the Azimuth relief valve activation. A spanner for a correct tightening of the cylinder first stages. A filter filling set for the soda lime including a plug to avoid that the soda lime could casually go into the chamber directly connected to the inhalation breathing bag and a funnel in order to refill with the right quantity of soda lime.